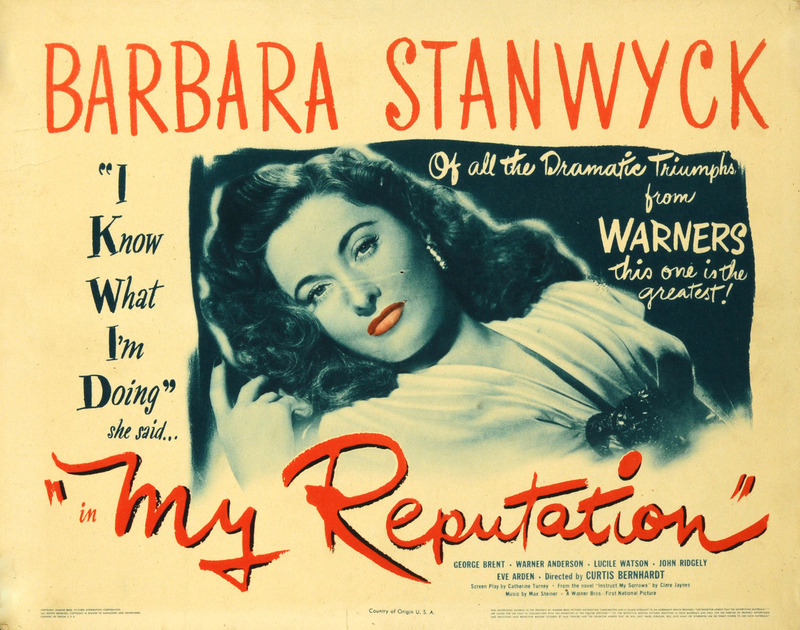 Warner Bros.’ big prestige picture of 1940 was an historical romance called “All This, and Heaven Too.” At the time, it was the most expensive picture Warners had ever produced. Sixty-five exterior sets and thirty-five interiors were built specifically for this production. It’s a long, sumptuous, romantic picture, told almost entirely in flashback; if you’re willing to overlook a considerable amount of silliness, it’s a comfortable and absorbing affair; several moments in it are exquisitely beautiful, but there is much about it that I find grating and unfortunate — most notably the numerous occasions when the writing and acting veer off-course and land deep in the thickets of camp. At its best, the writing is excellent, which prevents the camp excesses from giving me the dubious pleasure I get from, say, camp classics such as “The Damned Don’t Cry” and “The Bad Seed.” Those pictures are so uniformly crummy that the crumminess is what makes them fun to watch. Quite the opposite with “All This, and Heaven Too”: it could have been a great picture, but it’s undermined by its many lapses of judgment and taste. Most of the acting falls somewhere between good and excellent, but two performances (one important: Barbara O’Neil, one not: Richard Nichols) are staggeringly terrible. Perhaps it’s a bit mean-spirited to pick on little Richard Nichols (who was only four years old at the time), but he was in five pictures in 1940 (including “Kitty Foyle,” for which Ginger Rogers won that year’s Oscar for Best Actress), and in all of them, he is excruciating. The following year, he had a rather more important part as Lars-Erik in “A Woman’s Face,” where he’s imperilled not only by Joan Crawford, who intends to kill him for the money he stands to inherit, but also by that Teutonic super-villain par excellence, Conrad Veidt, who takes over the assignment when Miss Crawford proves too squeamish to finish the job. Everyone who watches old movies has one child actor he dislikes more than all the others: Margaret O’Brien infuriates many people of her own generation (I’m not crazy about her myself — in “Meet Me in St. Louis,” she proved she couldn’t dance or carry a tune — but she was a reasonably good actress, and she grew up to be a smart, interesting woman); I know a lot of baby-boomers who loathe various members of The Brady Bunch and are especially poisonous about Susan Olsen, who played Cindy (and who can blame them? ); but for my money, Richard Nichols is the nadir of cutesy-pie child awfulness (edging out Judy Nugent by a coyly wrinkled nose). It is perhaps worth repeating what I’ve said in the past: I never blame bad child performances on the kids who give them, but on the swine who coach them and teach them to behave unnaturally before a camera. At all events, young Master Nichols made his last picture in 1944 and I thank him for it. 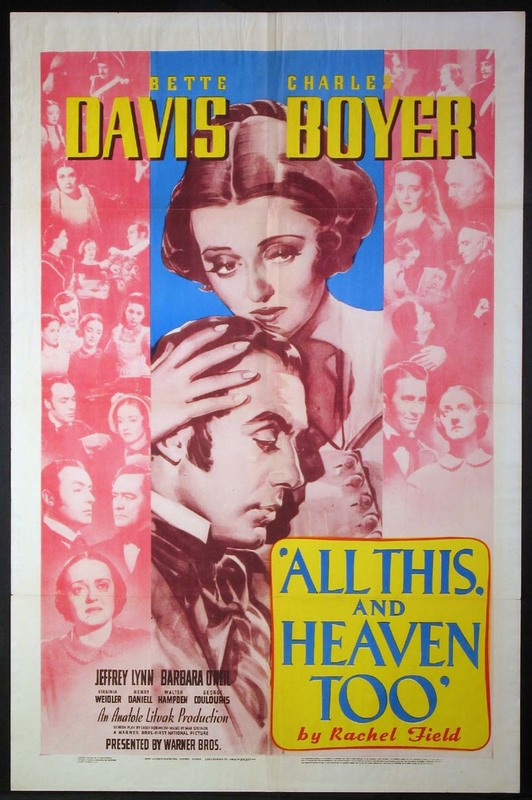 Based on the novel of the same name, “All This, and Heaven Too” tells the story of Henriette Deluzy Desportes (Bette Davis), a French governess who spent time in the notorious French prison, la Conciergerie, after having been implicated in the murder of her employer’s wife, the Duchesse de Praslin (Barbara O’Neil). M. le Duc (Charles Boyer) was charged with the murder of his wife; Mlle. Desportes was alleged to have been his mistress and therefore was implicated in the murder. The story is based on a real-life scandal that, according to a sentimental view of history, brought down the government of King Louis-Philippe in 1847. This isn’t entirely false, but history is always rather more complicated than it appears in romance novels and Warner Bros. pictures. The July Monarchy was already on the verge of toppling, and this scandal did much to inflame popular indignation against the government, but the monarchy did not fall because the combination of a loveless aristocratic marriage and a pretty governess ended in murder. Whenever this picture is shown on TCM, there’s nearly always a mention about O’Neil’s range as an actress: the year before this, she played the soft and gentle mother of Scarlett O’Hara. In that one, she made no impression whatever; in this one, she’s a drag queen from a Charles Busch travesty, but without the compensation of also being funny. It’s a hard performance to forgive, though it’s not entirely her fault. So much of the rest of the picture is sensitive and emotionally complex, that the presence of this English panto villainess at its center throws a monkey wrench into the story’s works. O’Neil makes no attempt to understand this woman’s violent temper: there’s no trace of an emotional process in her performance, no evolution of jealousy as it festers and turns into full-scale madness. Instead, she plays a foregone conclusion: she’s an aristocratic virago without rhyme or reason. And here is Davis at her best in this picture. She and Boyer got along well enough, but she fought with Litvak, who was a good friend of Boyer’s. (Litvak directed Boyer in the French picture, “Mayerling” two years earlier.) I think this is the best scene in the picture. Everything is right with it. Robinson’s writing is elevated, but not fulsome. Henry Daniell, that ubiquitous Nellie from the Studio Era, is on hand to snarl and make prissiness looking menacing; Jeffrey Lynn is bad in an impossible part; Ann Gillis as Emily Schuyler, the vicious little pupil who sets schoolmistress Bette Davis a-talking about her life-story, is campily amusing (“Mam’selle, can you tell us how to spell Conciergerie?”): she’s the template for all the venemous little girls in flouncy dresses (Veda Pierce, Rhoda Penmark, et al.) to come. But she, too, pulls the story in the direction of camp, much to the picture’s detriment. This entry was posted in Main and tagged A Woman's Face, All This and Heaven Too, Barbara O'Neil, Bette Davis, camp, Casey Robinson, Charles Boyer, Conrad Veidt, Henry Daniell, Joan Crawford, Margaret O'Brien, Max Steiner, Rachel Field, Richard Nichols, Susan Olsen on August 23, 2013 by TR.